The hats are tailored to fit your size. Special price: ￥50,000 for each hat. It will take about a month to deliver a hat. Let us know your size according to the chart below. On the decorated part, an organza ribbon, feather and mink fur are arranged in a floral motif. Black net material is used on the rim. A tastefully designed organza hat. Brown material with emerald green colored rim. A large size floral decoration gives a beautiful accent. and the materials used are silk and taffeta. The contrast of white and black is very beautiful. 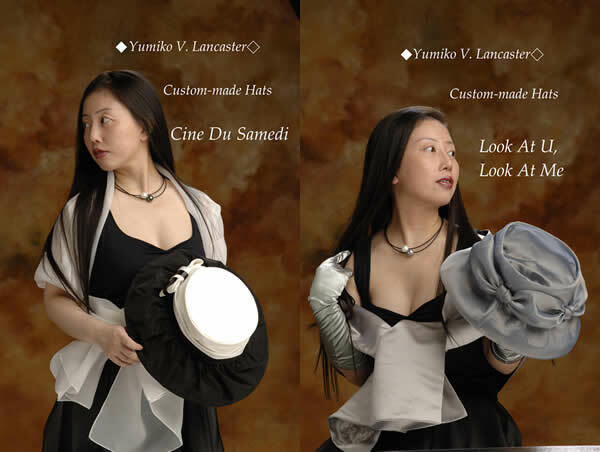 The material of the hat is organza. The color is soft gray-silver.